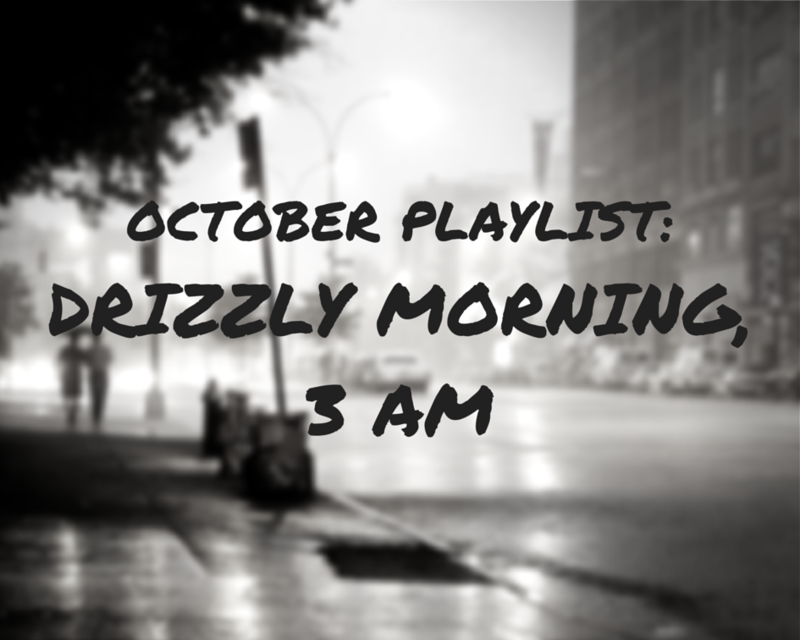 October Playlist: Drizzly Morning, 3 a.m.
this article first appeared on zelda & scout on 10/15/14. it was co-written with kelsey goldman. Don’t you just love New York in the fall? While it does put us in the mood to buy school supplies, those drizzly October evenings can get us feeling a bit melancholy and nostalgic, wistful for days past or for dreams still unrealized. When it’s 3 a.m. and sleep is nowhere in sight, sometimes all you can do is watch the rain drizzle down your window and listen to something a little softer, a little slower, tinged with rain-soaked leaves and blustery cloud-streaked skies. This is our soundtrack for late nights that creep into early mornings. Listen while snuggled in your bed, preferably with a mug of steaming tea within reach. Sometimes it’s healthy to get a little pensive. As always, when it comes to listening you can pick your poison: we’re on YouTube and Spotify, or just click below and let the music play as you read on. 1. Lights: Chris Rubeo – We first came across this Brooklyn-based artist through the soundtrack to “The Outs,” our favorite brilliant zeitgeisty web series of ever (season three pretty please?). This song in particular has a dreamy, old school feel. The first opening crescendo gets us every time, sweeping us up, up, and away into dreamland. 2. Kathy’s Song: Simon & Garfunkel – If Zelda were to compile a list of ten essential songs, desert island material and the like, this would make the cut, no question. The perfect rainy day song, its romantic musings are the stuff of misty evenings that tiptoe into rainy nights. Plus, these Queens boys are New York through and through (even if Paul was technically born in Jersey). 3. Green, Green Rocky Road: Dave Van Ronk – One year ago, if you had asked the average human who Dave Van Ronk was, you had a 99% chance of being met by a blank stare. That figure has since changed a bit, thanks to a little film called “Inside Llewyn Davis” based on the folk musician’s story and struggles, but he still remains in the shadows of his more popular contemporaries: Peter, Paul, Mary, and Bob (Dylan, that is). If you haven’t heard him, you are missing out. Plus, any song that allows you to sing “hooka dooka soda cracker” is a-ok in our books. 4. Map of the World: Monsters of Folk – “There’s a map of the world on the wall of your room, green pins where you want to go, white pins where you been, there isn’t even ten, you’re already feeling old.” This song, part of a one-album collaboration by Jim James (My Morning Jacket, fellow Louisvillian), Conor Oberst and Mike Mogis (both of Bright Eyes), and M. Ward, speaks uncannily to the angst of wanderlust-ridden twenty-somethings torn between where they are, where they’re from, and where they want to go (i.e. us). Yes, life is long and there’s still plenty of time for adventures, but late at night we find ourselves impatient, fingers creeping towards Skyscanner and thumbing for travel books. 5. Let’s Be Still: The Head and the Heart – Sometimes, after a long day of hustle and bustle, it can be hard to shut our brains off. Our thoughts run rampant, twisting and turning through to-do lists and half-remembrances and daydreams that endure when the daylight has long since faded. This is the moment when you turn to the clock and realize a decent night’s sleep just isn’t in the cards. There’s nothing to do but lie back, embrace the insomnia, and let your thoughts wander where they will. 6. Murder in the City: The Avett Brothers – A perennial Zelda and Scout favorite, particularly since we moved to the city. We are big fans of the brothers called Avett, and this song in particular speaks to our metropolitan existence, far from those who share our names. The fact that this song is so damn pretty certainly doesn’t hurt either. 7. Bulletproof Weeks: Matt Nathanson – This song is Scout’s go-to rainy evening jam, particularly as September seeps away and October rolls in. Gracing our ears courtesy of Nathanson’s breakthrough album Some Mad Hope, it reeks of lying in bed too long, listening to the M train roll by outside your window, as steam rises off a cup of hot tea on your nightstand. 8. I Was Young When I Left Home: Antony & Bryce Dessner – One of many, many fantastic tracks off “Dark Was the Night,” a 31-track compilation featuring artists from Cat Power to the National (band member Bryce and his twin brother Aaron curated the album) and dozens in between, all of whom came together to raise funds for the HIV/AIDS charity Red Hot Organization. This Dylan cover reaches way back to American folk roots (the song is a reinterpretation of the traditional ballad “Nine Hundred Miles”). Marcus Mumford also does a heartachingly lovely cover, which we recommend. 9. Solitaire: Wilco – Masters of the poetic lyric and the acoustic jam, Jeff Tweedy and the gang have been tugging at our heartstrings for many moons. This is our favorite track from “Wilco (The Album)” — the band’s seventh. For those moments when you think the world is crazy, or maybe you are: We’ve got reservations about so many things (especially late at night), but not about this. 10. Palmyra: Houndmouth – We’ve told you before of our love for Houndmouth. As you may recall, we’ve seen them an absurd amount of times (with no plans to stop). However, it wasn’t until their most recent Brooklyn show, Zelda’s eighth, that she saw them play this song, one of her favorites. Sweet and lovely, full of the melancholy romance of missed chances and might-have-beens. We can smell the grass, still wet with rain, that Matt Myers cut while he wrote it. 11. How We Love: Ingrid Michaelson – Another of Zelda’s rainy day favorites. This song is for those late night moments when you lie awake, parsing through the interactions of your day and thinking of the things you might have said, the connections you might have made instead of letting them slip through your fingers — conjuring up might-have-beens with that person who is sort of maybe more than a friend, and spinning through the things that might come to pass should the universe conspire to bring you together (Just us, you say? We don’t believe you.). 12. Girls Just Want to Have Fun: Greg Laswell – Greg might be better known for being the better half of Ms. Michaelson, but we love Ingrid’s hubby in his own right. This ranks high up on our list of awesome covers, ones that take an iconic song and transform it into something completely different. Cyndi Lauper never sounded so existentially fraught. 14. Hello: Schuyler Fisk – There’s nothing wrong with a little late night musing on an ex-person who you just can’t quite shake. Then there’s picking up your phone to text said someone, giving them a nudge (or, god forbid, a poke) to make sure they remember you’re still around. This song is for those decisions, more often bad than not. What can we say: nothing good happens after 2 a.m., and try as you might to convince yourself, you did not sound breezy. 15. Back to Manhattan: Norah Jones – This song is the perfect encapsulation of the Brooklyn/Manhattan dichotomy, all sung to us by the lovely Norah Jones, whose sweet and sultry tones were made for rainy nights. The smell of wet leaves mingles with cider and fire smoke, and that steady tapping of the rain is punctuated by the rumble of a train, clattering across the bridge. 17. If You See Her, Say Hello: Bob Dylan – No New York folk-tinged playlist would be complete without a little Dylan. As the sun creeps up, you realize that flight of romantic fancy was nothing but a product of the late hour and the rain. You tuck your someone back in their box, but not unkindly. You wish them well, after all. As long as they’re not well with someone else. 18. Chelsea Morning: Joni Mitchell – The sun is up, the clouds have cleared, and the city has that just-washed clean rain smell that will last approximately 17.2 minutes before the street meat and subway exhaust resume their posts. For now, breathe in deep and set off for your day. The only thing better than a rainy autumn evening is a gorgeous, sunshiney fall day, ripe for the taking. You can find us in Central Park, latte in one hand and a good book in the other, with a scarf around our neck and these songs in our ears. Like what you see/hear here? Be sure to check out our previous playlists for road trippin’ and sidewalk stompin’ vibes.